“Excuses are made by those who make mistakes. Apologies are made by those who did something wrong. I did neither, but I do want to explain my lapse in writing. 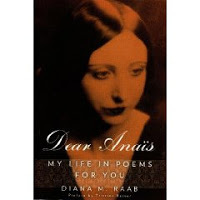 My new poetry collection DEAR ANAIS: MY LIFE IN POEMS FOR YOU (preface by Tristine Rainer), was released this week and I have been busy with the preliminary publicity. I hope my readers buy this book not only because I admire Nin and her wise words about writing, love and life, but the collection is a good example of how poems can be culled from journals. All the poems in the book were born on the pages of my journal. (BTW, if you read the book and enjoy it, please consider posting a review on Amazon…it will help other readers and me of course! )Many of the poems were inspired by a famous quotation, a compelling line or an observation. These all serve as good launching points. Poetry is all about observations and the more you see, the stronger your poetry will be. This Photo of Anaïs Nin in 1932 was lifted from an early Nin web site now defunct. However, in honor of Google’s tenth anniversary, they opened a window to the old search engine…and we found the entire site on the wayback machine an entire site with lots and lots of very fine academic stuff (from Leipzig) the pages were maintained byAnja Beckmann. Thanks Way Back Machine…and don’t lose this link. We hope it works for a long time as the original URL is no longer functioning. Anaïs Nin’s mother, Rosa Culmell y Vaurigaud, was born in 1871, the eldest daughter of the Danish consul to Havana, Thorvald Culmell Christensen, who was born in Denmark, and his wife Anaïs Vaurigaud y Bourdin, of French descent but born in Cuba. Thorvald was a successful businessman and they lived in a big house on the Malecon beachfront, a fashionable area of Havana. The couple eventually had 9 children, 5 daughters and 4 sons, and were of the highest social standing in Havana. Anaïs Vaurigaud, the grandmother of Anaïs Nin, left her husband and her children and moved into her own house in Havana where she lived as she pleased. As Rosa was now the oldest daughter it fell to her to organise the household, a task for which she was well prepared during her education in the exclusive Brentwood catholic convent school in Long Island, New York, where she also learned perfect English. Due to her important role in the Culmell household she was still single at the age of 30. She had singing lessons and was said to have a beautiful voice. Anaïs Nin’s father, José Joaquin Nin y Castellanos was born in Havana in 1879, the first son of a Spanish Cavalry officer, Joaquin Nin y Tudo, and his Cuban wife Angela Castellanos y Perdomo. The family moved to Barcelona in 1880 and Joaquin Nin stayed there until he was 21. He studied the piano and eventually became a concert pianist, he departed for Havana in 1901 and gave his first concert there in february, he had to live with money from relatives, though, as he had not yet made a name for himself. Joaquin and Rosa met in a music store in Havana. She was independent, much older and more mature than him but they shared a love for music. She fell for the romantic image that he cultivated and he sensed that she would help him to further his career. Her father was against a marriage with the poor musician from Barcelona but allowed Rosa to have singing lessons with him and they soon gave their first joint concert. They married on April 8, 1902, and Rosa’s father paid fro them to go to Paris and live there until Joaquin could look after the family with his own income. Happy Birthday Google! and hey thanks for these oldies but goodies and reminding us of the Wayback Machine.